Heat oven to 400°F. Unroll pie crusts on work surface. With 4 1/2-inch round cookie cutter, cut 4 rounds from each pie crust. Spoon about 2 tablespoons pie filling onto center of each pie crust round. Firmly fold edge of crust over sides of filling, ruffling decoratively. Place on ungreased large cookie sheet. Bake 15 to 20 minutes or until crust is golden brown. Sprinkle marshmallows over filling. Bake 3 to 4 minutes longer or until marshmallows are puffed and just beginning to brown. Cool completely, about 30 minutes. 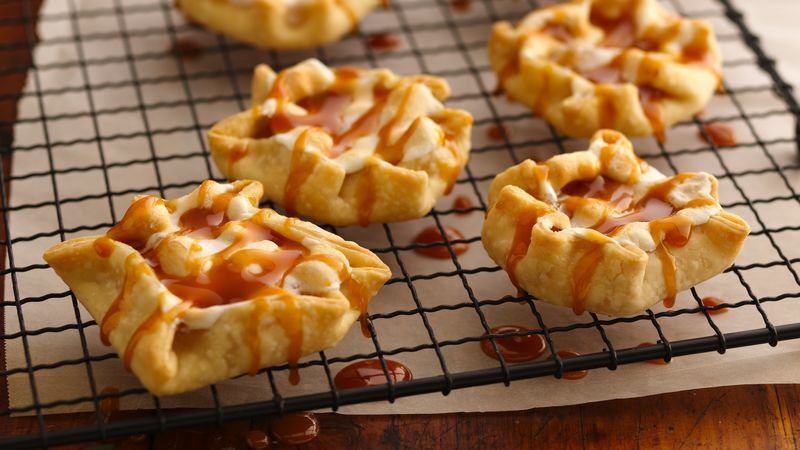 Just before serving, drizzle about 1 teaspoon caramel topping over each tart. For an elegant presentation, serve each tart on a small doily placed on a dessert plate.